Midnight is made from a fuzzy grey material covered in black patches. He has a bright orange belly and long brown fur on his face. 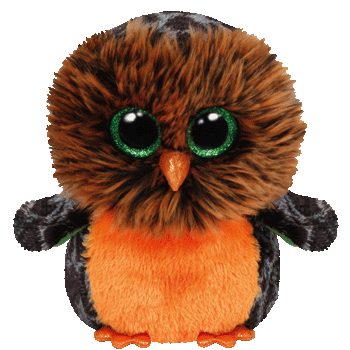 He has large sparkly green and black button eyes and his beak and feet are made from a glittery orange material. I fly all around but stay out of sight! Midnight was introduced on 1st July 2015. His birthday is on 15th January. Midnight is a Halloween themed Beanie Boo. This is the small 6″ version of Midnight. He was also released as a medium 9″ Beanie Boo Buddy. This is the second Beanie Boo to be called Midnight. There was a bat called Midnight who retired on 7th November 2014.